The Nissan E-NV200 is 100% electric with a range up to 187 miles from a full charge. The new 40kWh battery which is also in the New Nissan Leaf produces zero emissions making it exempt from city centre restrictions and pollution legislation. Despite the bigger battery capacity that has increased the range on the E-NV200, the load space has not been impacted at all. The 4.2m³ area is able to transport two Euro pallets with ease. You can also carry items up to 2.04m in length. It's not just eco-friendly, it's practical as well. At just 4.4m long and 1.69m wide, negotiating built-up urban areas and getting into parking spaces is a breeze. The E-NV200 has a payload up to 705kg and its cargo floor is only 153mm from ground level so that loading your cargo is quicker and easier. 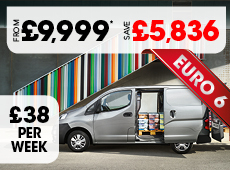 THE E-NV200 PANEL VAN IS AVAILABLE FROM ONLY £345 PER MONTH. THAT IS JUST £79 PER WEEK!